dotmailer has been named as Movable Ink’s EMEA Partner of the Year and we couldn’t be more thrilled! As part of Movable Ink’s summer campaign, the brand reached out to all its partners and proposed a friendly competition. This sparked engagement and helped better inform wider teams, as well as our customers, of the powerful technology available. Never one to back down from a challenge, dotmailer set its eyes on the prize and swept away the competition. At dotmailer, a lot of careful consideration goes into who we choose to partner with. Dedicated to giving our customers the best service around, we only pick the best partners who are as dedicated to their customers as we are. Movable Ink (MI) allows brands to create compelling and beautiful dynamic content for emails – a perfect match for our smart marketing automation platform. This valuable partnership empowers our customers to take their content to the next level. One of the hardest challenges in partnerships is getting everyone aware of what’s possible with the collaboration; the competition was a genius idea to engage all departments and provide a buzz in the office as we debated the answers. 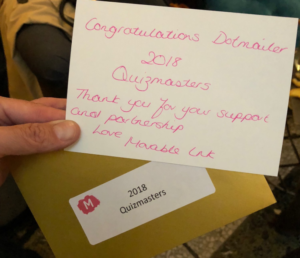 We must have done something right which is why you’re now looking at the Quizmasters! To stay on top, we make it a priority to know all there is to know about our partners. This means our Account Managers can fully represent our partners when discussing solutions with clients. That’s why our services are second to none. We’ve taken the spirit of the competition to heart and launched our Partner Lightening Talks. These give our partners a chance to come in once a month and showcase what they do to our teams. Extending our network with our partners is crucial to our success. Lightening Talks will allow us to share knowledge, improve our services, and add even more value to our customers.